Disney’s 1941 animated film “Dumbo” is a fantasy: animals talk, elephants fly and the setting of a circus gives a dreamlike sense to the whole movie. For all its controversy, Dumbo as a character has flown into audience’s hearts and into the Disney canon: he’s so popular he even has his own Disneyland ride, where guests can take the same magical flight the baby elephant made in the movie. Whimsy was easy for the animated version of “Dumbo,” easily blurring the lines between fantasy and reality. Dumbo is brought to his mother by stork. 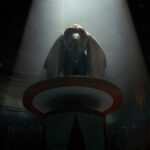 The circus animals speak and wear human-like clothing, becoming characters who move the plot forward. Dumbo’s mother sings a memorable lullaby that still makes us cry. 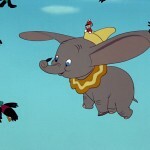 And, of course, Dumbo uses his comically large ears to fly. Because the 1941 movie was animated, it was able to mix fantasy and reality in a very short amount of time—just short enough to let our imaginations wander without questioning the logic of Dumbo’s world. In contrast, the Tim Burton’s 2019 live-action “Dumbo” chooses not to walk the same line. 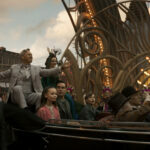 In the film, Holt Farrier (Colin Farrell), along with his children Milly Farrier (Nico Parker) and Joe Farrier (Finley Hobbins), live and work within a circus owned by ringmaster Max Medici (Danny DeVito. Reeling from the loss of their wife and mother, the Farriers struggle to care for newborn elephant Dumbo when, discovering he can fly, entrepreneur V. A. Vandevere (Michael Keaton) and trapeze artist Colette Marchant (Eva Green) attempt to make Dumbo the star of their new amusement park. Because the film’s medium favors realism, human characters take precedence over Dumbo. He’s still a central character and he still flies, but because we’re watching a film where humans and elephants co-exist—a world like our own—the plot happens largely because of the decisions made by people, not by Dumbo. Instead of seeing Dumbo and Timothy Q. Mouse converse and take action, we watch as humans move the story forward. There is a clear divide between humans and animals in the live-action film. No animals talk, and they are part of the circus more as performers rather than actors, much like animals in real-life circuses. Because the setting has to be more realistic, we lose the magic of anthropomorphized animals and instead, gain new human characters. This makes for a longer, more expanded movie, since it must also explain human backstories, conflicts, and personalities. The movie is much longer than its animated counterpart, centering the spotlight on humans rather than on Dumbo. Dumbo then becomes less of a character and more of an exhibit. Much like the audience within the movie, we see Dumbo largely in the context of his performances. In the 1941 animated film, his real triumph occurs not only when he flies, but when he is finally reunited with his mother. In the live-action, we cheer for Dumbo most when he takes flight, which happens multiple times throughout the movie, not just at the end. The live-action “Dumbo” is different than its animated counterpart, largely thanks to its different method of storytelling. It is not a short, fantastical story about an elephant in a circus. Instead, it’s a grown-up tale of family, grief and invention that also involves a flying elephant. People looking to enjoy a lighter story about Dumbo may be disappointed. 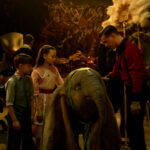 But the real triumph of the movie is in the way Dumbo changes the relationships between the human characters, all of whom are new and have interesting and realistic conflicts they must face.